After Massive Response Last Week, Are Low Rates Already Gone? While interest rates are always a topic of conversation in the housing and mortgage markets, everyone was talking about them last week. That tends to happen when the average 30yr fixed rate threatens to break into the high 3% range after a long absence. But just as quickly as the good times started to roll, rates bounced higher this week. Are the good times over? 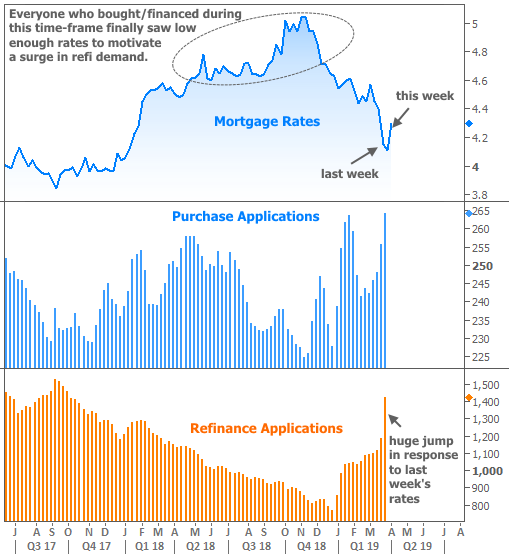 First off, let’s take a look at the effects of last week’s big drop in rates so we can better understand “the good times.” As the following chart shows, there was a big, immediate response in refinance demand, according to the Mortgage Bankers Association’s (MBA) weekly application data. It was by far the biggest jump in several years–not all that surprising considering last week made March the best month for mortgage rate improvement in more than a decade. In addition to the jump in refi demand, the purchase market also benefited from lower rates, though not as much as it may seem. There is a strong seasonal component to the MBA’s purchase data, and we would expect the Spring homebuying season to be building toward the year’s best levels as it did around this time in 2018. What happens if we widen our frame of view significantly? Will the uptick in applications still be meaningful? And where are rates in the bigger picture? In terms of refi applications, even though last week was a tremendous improvement and the highest level seen in more than 2 years, it was just a drop in the bigger-picture bucket. Reason being: it’s really only mortgages originated in 2018 that would stand to benefit from a refi. Everyone else already had a lower rate or a chance to refi into one. Last week just happened to be tipping point for a large portion of those 2018 mortgages. Even then, many who bought homes in mid-to-late 2018 (the ones that are “in the money” with respect to refinancing) aren’t yet thinking about a new mortgage simply because it’s not common to refi so quickly after a purchase. In other words, if those homeowners had been living with their high rate since 2016-2017, a larger percentage of them would be looking for refi opportunities. More importantly, there simply isn’t a big enough refi pool at the moment for current rates to accomplish what they accomplished in 2010 (see the chart above, and the refi demand levels relative to rates in 2010). Leading up to that refi boom, rates had been even higher than they were in 2018 and purchase activity even higher (i.e. plenty of refi candidates). Then by mid-2012, all of those refinancers were in a position to pull the trigger again, not to mention anyone that had purchased in the first 8 months of 2011. But enough about refis! 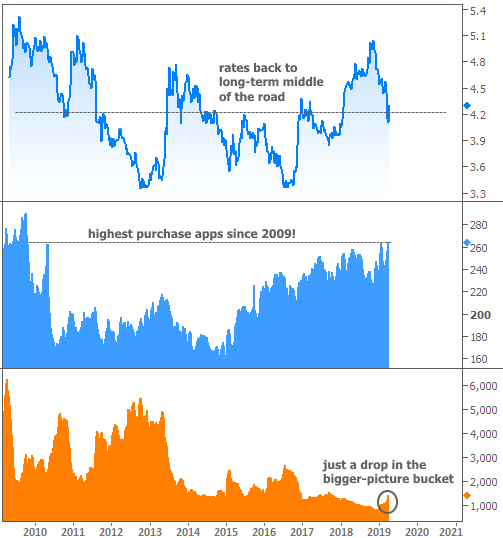 What’s up with the purchase market hitting the highest application levels since 2009? This has actually been on our radar for quite a while (and I predicted it in this previous newsletter due largely to seasonality), but there’s no doubt the drop in rates helped grease the skids. The bigger question is whether this drop was temporary or just the beginning. Unfortunately, that can’t be answered by anyone in any reliable way. I think we’ve seen the lion’s share of the improvement we’ll see due to the change in the Fed’s stance in mid-March (discussed here). From here, it will depend almost entirely on the incoming economic data and the policy developments likely to impact future economic data. 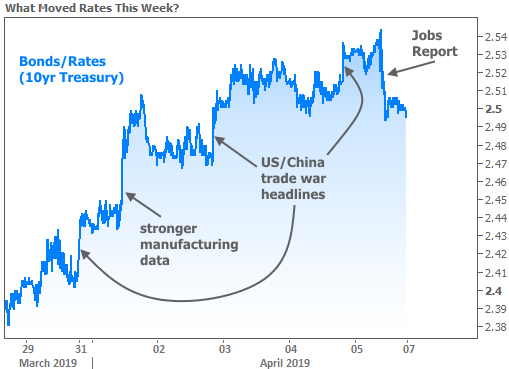 Case in point, it was strong economic data and news of progress on US/China trade talks that accounted for the noticeable jolts this week. Friday’s jobs report shows us how mixed-to-weaker economic data can push back in the other direction (NOTE: the jobs headline wasn’t weaker, but several of the internal components–like wages–were well under the median forecast). US trade policy will remain in focus, but markets will add Fed policy to the agenda for next week. Wednesday afternoon brings the Minutes from the most recent Fed meeting. This gives investors a deeper look at the discussion that resulted in the Fed’s surprising announcement on March 20th. On the same day, the EU holds an emergency summit to decide if the Brexit saga will continue. And it almost certainly will, but if for some unforeseen reason Britain finds itself unable to negotiate another extension, rates would likely drop in response. Best Month in a Decade For Mortgage Rates! We were introduced to Caroline through our Realtor. She was friendly, welcoming, and easy to work with. We would definitely recommend Prime Mortgage Lending! Caroline and her assistant have been so patient and willing to explain things while working through any problems that came up. Prime Mortgage was friendly, welcoming and easy to work with. We will definitely recommend Prime Mortgage!